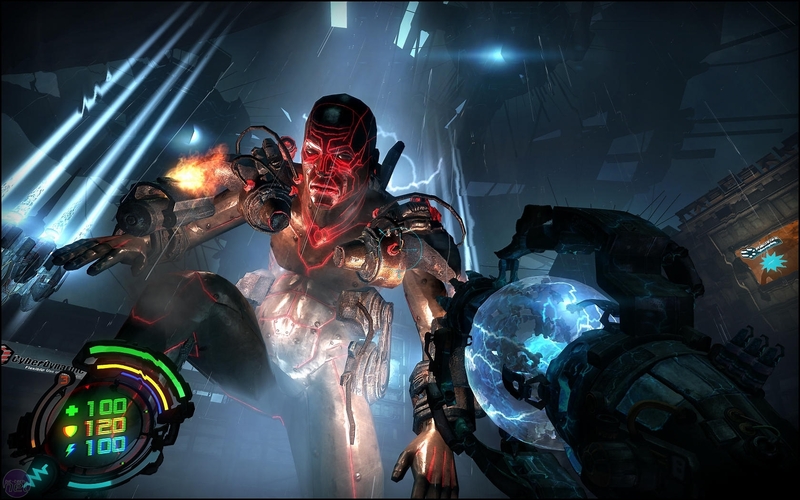 Hard Reset has been marketed on a very delicate implication; that developer Flying Wild Hog Studios would be able to combine the influences of its team members' previous projects - which notably include Painkiller and The Witcher - and create a title that boasted narrative depth and furious combat. As it turns out, though, Hard Reset's biggest problem is that it succeeds almost a little too well. The storyline is the logical starting point, if only because Hard Reset is an exclusively singleplayer game. Wearing its cyberpunk influences on its sleeve in the form of gravelly voices and constant in-level holographic advertising, Hard Reset tells the story of Major Fletcher, a future cop who's tasked with fending off a robotic rampage that threatens the grossly named Bezoar City. While this information is all unveiled before the end of the first level, there are already huge gaps left in the story that beg to be filled in. Why are the robots trying to kill everyone, and just what do your gruff superiors mean when they say the city has been 'breached'? Barely fifteen minutes into the first mission and there's already a rising swamp of confusion that isn't helped by the bare-bones script. What some might call depth, we think borders on being impenetrable. The situation doesn't clarify as you venture deeper, either. Somewhere around the third or fourth mission you manage to catch up to an apparent antagonist, who predictably reveals that he's really a misunderstood hero. Mumbling something about a plague of which you were a lone survivor, the Professor then kills himself so you can absorb his consciousness. Apparently you can do that, even though the ability is never mentioned until that point. The further you delve into Hard Reset's campaign, the murkier the waters become; the motivations of the characters and the scope of the setting getting increasingly lost in a game that prioritises broad strokes over fine details. What seems to matter to Flying Wild Hog Studios isn't that the comic-styled cutscenes make sense, but that the overall tone is sufficiently grimy and futuristic. The result, unfortunately, is that while Hard Reset has a beautiful and consistently realised world, which is filled with nods at commercialism and a jaded populace that's on the brink of self-destruction, there's little sense of the why behind it. After three hours we were still wondering who the baddies were, or why we were fighting them. This is not good in an exclusively singleplayer game. Mercifully, while the story proves to be unwieldy and obtuse on the whole, Hard Reset doesn't make a big deal out of itself on this front. It's here that the Painkiller influences come in, with much of the game presented with a kind of 'Whatever, just go blow stuff up' style of self-awareness. 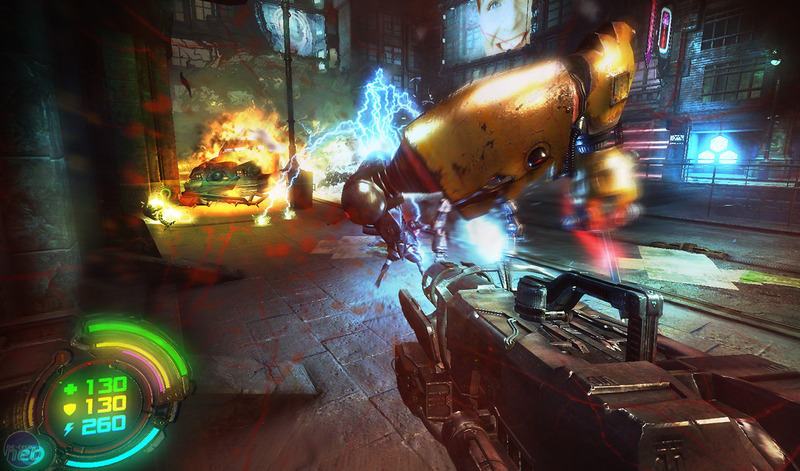 Hard Reset's Redux edition isn't unwelcome, just unnecessary.